CarbonTracker produces model predictions of atmospheric CO2 mole fractions, to be compared with the observed atmospheric CO2 mole fractions. The difference between them is attributed to differences in the sources and sinks used to make the prediction (the so-called 'first-guess') and the sources and sinks affecting the true atmospheric CO2. 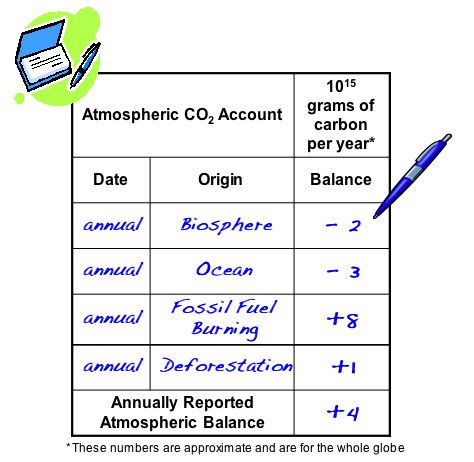 Using numerical techniques, these differences are used to solve for a set of sources and sinks that most closely matches the observed CO2 in the atmosphere. CarbonTracker has a representation of atmospheric transport based on weather forecasts, and modules representing air-sea exchange of CO2, photosynthesis and respiration by the terrestrial biosphere, and release of CO2 to the atmosphere by fires and combustion of fossil fuels. More details about these different components and why they are needed can be found in our CarbonTracker documentation.